Vital in every aspect of our body, the "building blocks", also known as essential and non-essential amino acids that make up protein, play important roles in our body. Protein is responsible for providing necessary nutrients to every cell in the body. Because our body is not able to make or store essential amino acids on its own, consuming a nutrient rich protein daily is extremely important. 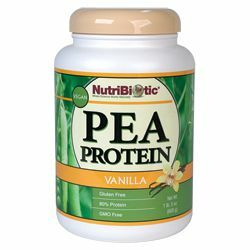 NutriBiotic Plain Pea Protein is an excellent source of plant-based protein derived from sustainable yellow peas (pisum sativum) that are 100% grown and processed in the U.S. This highly soluble and easily digestible protein powder contains an extensive array of naturally occurring essential and non-essential amino acids, and is rich in High Branched Chain Amino Acids (BCAAs). Simple and delicious! NutriBiotic Pea Protein is made from the highest quality, non-GMO peas and is produced through a fermentation process without using any chemical solvents. 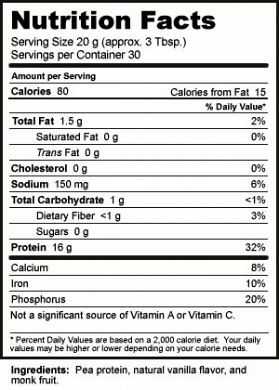 It does not contain any animal by-products, artificial flavors, artificial sweeteners, or artificial colors. Boost your nutrition and energy with these wholesome, protein rich formulas! Why would I want to use Pea Protein? - NutriBiotic Plain Pea Protein is an excellent source of non-GMO, plant-based protein derived from sustainable yellow peas (pisum sativum) that are 100% grown and processed in the U.S. It is a delicious, light colored, yellow pea protein packed with essential and non-essential amino acid. It is also a highly soluble and easily digestible protein powder. The Plain flavor has absolutely no added ingredients, for greater control of recipes or those with very restricted diets. It contains no animal by-products, no artificial flavors, no artificial sweeteners, and no artificial colors. We use pea protein that is gluten-free, cholesterol-free, soy-free, and dairy-free. It is suitable for low-carbohydrate dieters, vegetarians, vegans, children, athletes, and anyone needing extra protein in their daily diet. What kind of peas are used to make the Pea Protein? - The protein is derived from yellow peas (pisum sativum), also known as split peas. Where do the peas come from? - The peas are grown in the US. Our pea protein is also manufactured in the United States. Are there any chemicals used during the processing? - Our Pea Protein is not chemically processed. Absolutely no harsh chemical solvents are used to extract and purify our protein. Is the Pea Protein gluten free? - Yes, it has been tested by an independent, third party lab with none found. Is the Pea Protein an isolate? - A protein isolate must be at least 90% protein. Our Pea Protein has an 80% protein content and would be considered a concentrate. Which amino acids have you added, and are they from natural or artificial sources? - All amino acids in the pea protein are naturally occurring components of the peas. We have not added any amino acids. Should the Pea Protein be stored in the refrigerator? - We do not recommend storing the Pea Protein in the refrigerator as it may draw dampness. We do suggest storing it in a cool, dry location such as a cupboard. Are there any milk products produced on the same lines as the Pea Protein? - The same facility and equipment may be used on occasion to process whey, but the equipment undergoes a thorough allergen cleansing after the whey is processed so no cross contamination will occur. We recommend the plain for anyone with serious allergies to milk as we cannot control the flavoring companies allergen program.